A celebrated singer ,Jean Dupray,is torn between his wife,Maria , and a Femme Fatale . My Norwegian friend calls it " a guilty pleasure " and it is exactly what it is.Jean Delannoy who was a true believer made a lot of films directly dealing (or hinting at) with religion :" "la Symphonie Pastorale" "Dieu A Besoin des Hommes" "Bernadette" "Marie de Nazareth".That he transferred to the screen Sartre's "Les Jeux Sont Faits" was downright surprising. 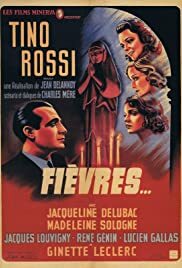 "Fièvres" begins and ends in a convent ;the first scenes show Tino Rossi's shadow singing "Ave Maria".Up comes a bloodthirsty man whose wife ran away with another guy.Then a priest tells him a long tale ,the story of a man who was once like him and who now leads a life of peace in the monastery.Flashback. The flashback is made up of two parts,the first one is a melodrama a la L'Herbier:a celebrated singer Jean Dupray,is torn between his wife (Madeleine Sologne)and a femme fatale (Jacqueline Delubac).As Tino Rossi was first a singer,this part is some kind of musical.A short dialog between the husband and the wife is sung,some kind of "Parapluies de Cherbourg" in miniature twenty years before.Jacqueline Delubac portrays an American woman but she never speaks English and she hasn't even got the slightest Yankee accent (Betty Stockfeld who was working in France would have been a better choice).But all is forgotten with the wife's death,Delannoy at his kitchest :while the hubby is singing "Maria" on stage ("a song dedicated to the human being I love the most")the aforementioned Maria,suffering from TB ,breathes her last. Incapable to cope with this loss,desperate ,the singer calls it a day and disappears .Then begins a second part which recalls Marcel Pagnol's style,and not only because it takes place under the hot sun of Provence. Jean is living in a humble small house with his new pal who is about to get married.But,alas,the soon-to-be-wife is played by Ginette Leclerc ("La Femme Du Boulanger" ) ,par excellence the "bad girl" actress.Not far from the village,ther's a convent (see above) and sometimes,Jean is drawn to this place where heavenly choirs are heard. A guilty pleasure,for sure,but a pleasure for all that!